A P.E.I. 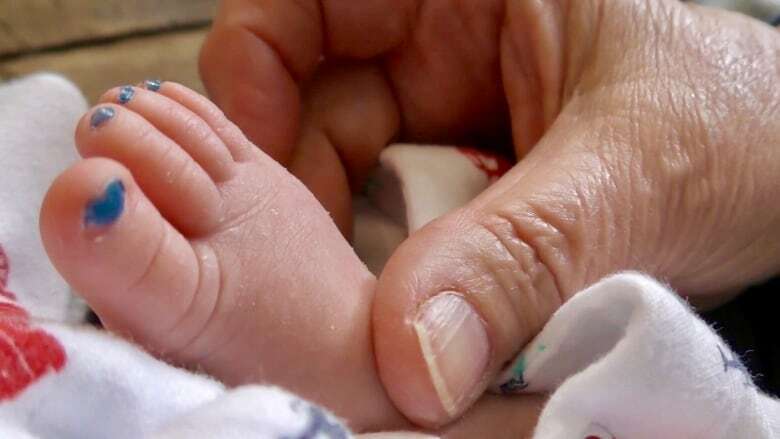 single mother with triplet newborns posted a plea for help on Facebook that was answered by three grandmothers, all sisters, who barely knew the family. The three are among Tignish residents now giving the woman helping hands. 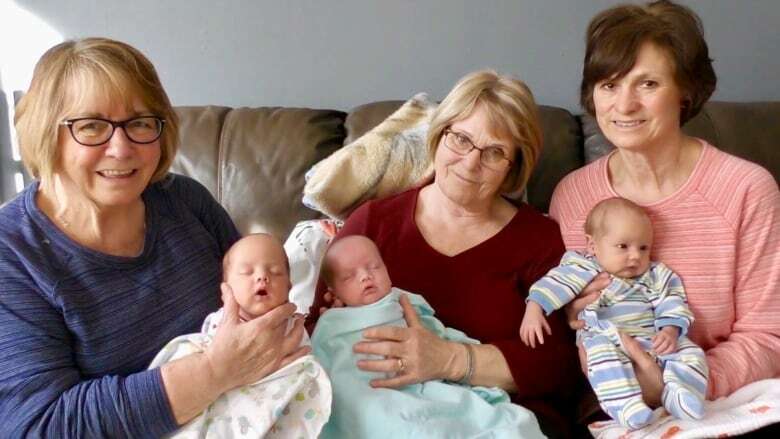 When single mother Hayley Arsenault posted a Facebook plea for help with her month-old triplets, three grandmothers who barely know her were among the Tignish, P.E.I., community members who answered the call. 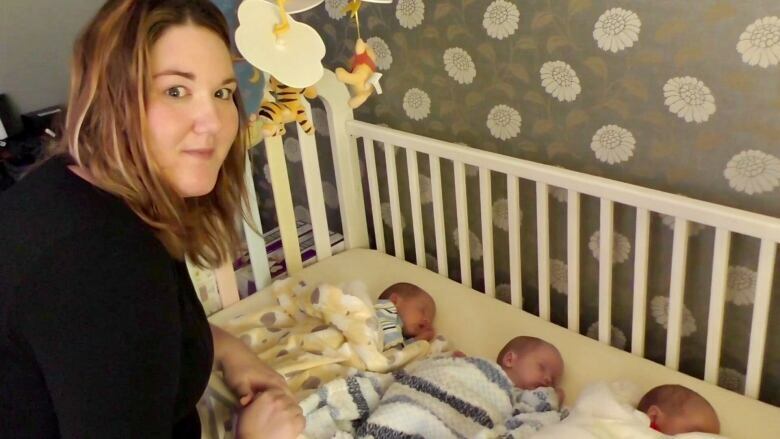 "Knowing what it's like to have one baby, it's a lot of work," said Jenny MacDougall, who takes shifts caring for the babies with her two sisters. "When I heard that she had three, I could really understand how exhausting it must be." Arsenault, 25, is often up all night with Hogan, Rylan and Finn. The daytime volunteers, including other members of the town of about 800 residents on the western tip of the Island who have signed up to take shifts, don't even see her much as Arsenault tends to use the time to sleep. "It takes a village to raise a child and we're willing to help out," MacDougall said. MacDougall and sisters Alice Mokler and Anita Arsenault (who is not related to Haley) come Wednesday mornings at 9 a.m.
Anita Arsenault also happens to be a retired licensed practical nurse (LPN). "I was awfully glad we were three," Arsenault said. "I don't know if I'd be so excited to come one alone. Three is perfect." 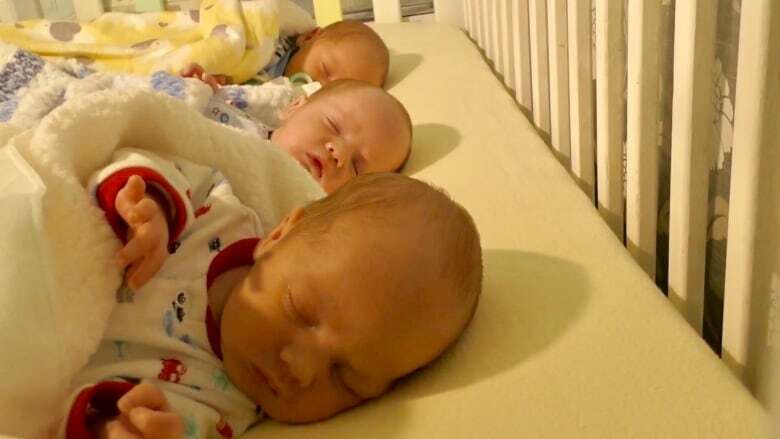 With each woman caring for one baby, each can give the triplets quality time. 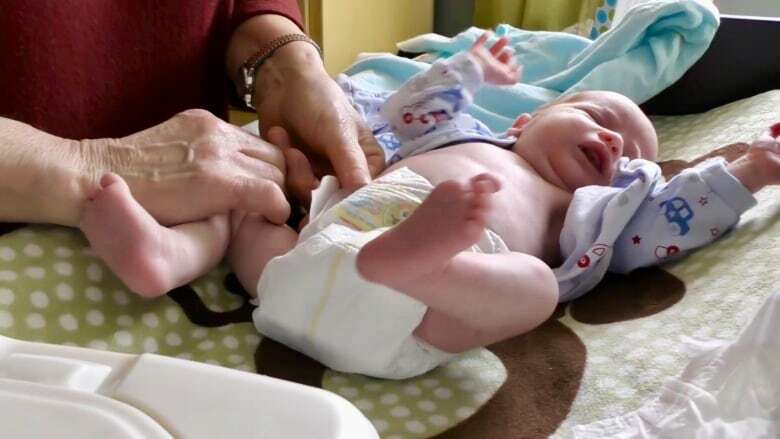 "Anita started feeding Rylan at 10 a.m. and he just did his final burp at 11," Mokler said. "So it does take a full hour to feed them. We can give them that time." The women don't mind changing a lot of diapers. "I don't see this as a chore in any way," MacDougall said. "For me, it's a gift to come here." It's also a chance for the three sisters to visit each other. "We chat, we compare the babies. Love every minute of it." The sisters also feel a special connection with the babies. 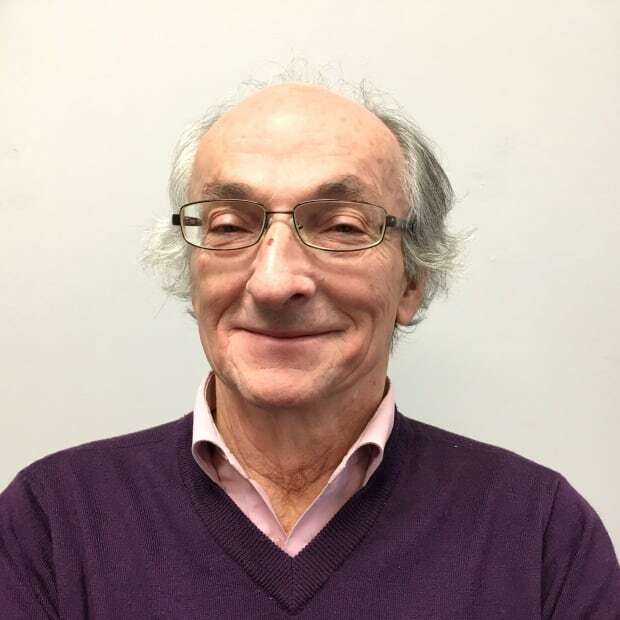 "I feel I'm bonding to them and this is the part I like the best," Mokler said. "Being with babies, just to smell them and to hold them." The sisters bring in food, and even do chores while the mom sleeps. "They trust us completely. They don't even greet us at the door," Mokler said. "We come in and we take over. So I'm doing the laundry right now, my sisters just did a little bit of cleaning." The triplets look similar, so telling them apart is difficult. "One of them I know was smaller at birth, so this is Finn," said Anita Arsenault. "He is the smallest one, I think. The other two, I'm not sure." Two of the babies look almost identical, so their mom has painted the toenails blue on one of them. "And I find Hogan's ears are a little different," MacDougall said. "So you're kind of starting to know who they are. And I think this is Hogan." The three women also have to keep track of the babies' schedules, especially for feeding. "Finn woke up at 9 a.m.," Mokler said. "But I held him and walked him and did different things just to cuddle him and to make him wait until his brothers woke at 10 a.m. so then they'd all be fed at the same time." Keeping the triplets on schedule makes it easier to care for them, Mokler said. "If not, you will always be feeding one. So this way, when they're all fed, they're going to sleep for two or three hours, and the mother can have a rest if she's alone. But if not, she could be feeding all the time." The schedule also applies to changing diapers. 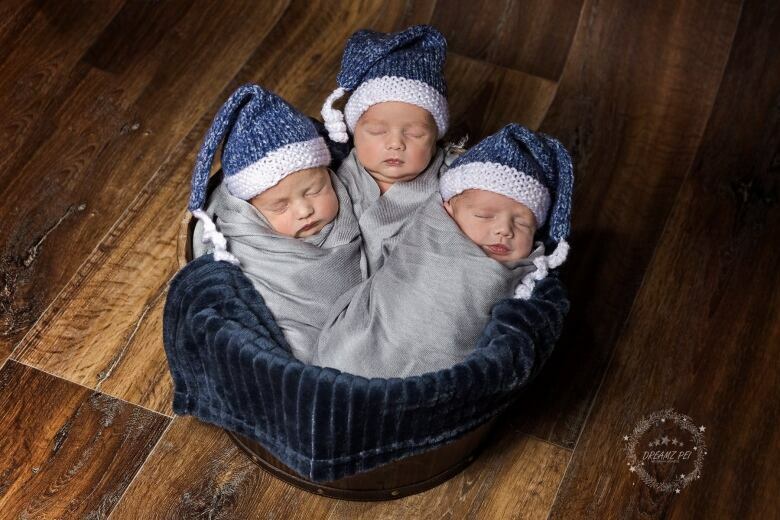 When the triplets wake from a nap, their diapers are changed before they're fed. The boys' grandparents, Wendy and Billy Arsenault, also take shifts to help out Hayley. Billy doesn't know what the family would do if the community hadn't stepped up. He said the babies go through about 250 diapers every week. "It's tiresome as it is, but it would be very tiresome. Everybody's been great." Just before the women's shifts end on this day, Hayley Arsenault woke up and came out to thank them. 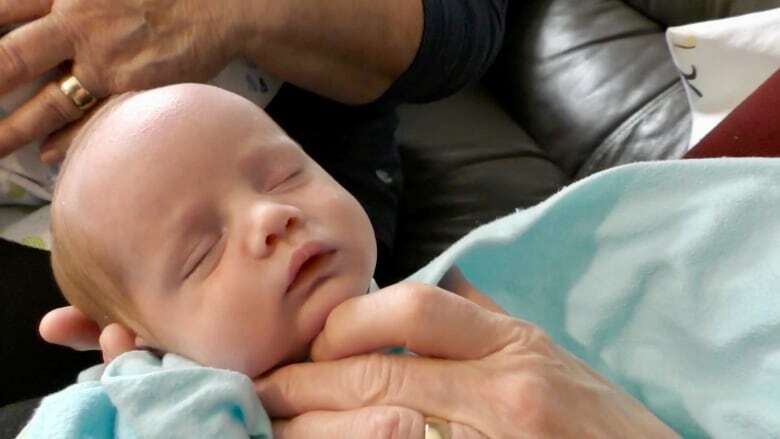 "To have strangers come in and actually make a connection with your babies is pretty amazing," she said. "They become people that you know and trust and that's the big thing." More help is welcome, but the sisters will be there for Hayley as long as needed. "I can't wait to see them in the Co-op some day, with the three in the strollers," Mokler said. MacDougall said she's in no hurry to stop. "I love it. I enjoy it. And I always said when I retired, the only thing I wanted to do was rock babies." An earlier version of this story used the name Alice Smokler. In fact, her name is Alice Mokler.